Dry Irish Stout pours nearly black with mahogany highlights and a creamy off-white foam. The aroma offers an appetizing mix of dark chocolate, coffee and cereal. The flavour expands upon the aroma, adding an initial malty sweetness and mild raisin-like fruit. The mouthfeel is full, silky and luscious. The finish features a dry minerality and roasty-toasty notes. 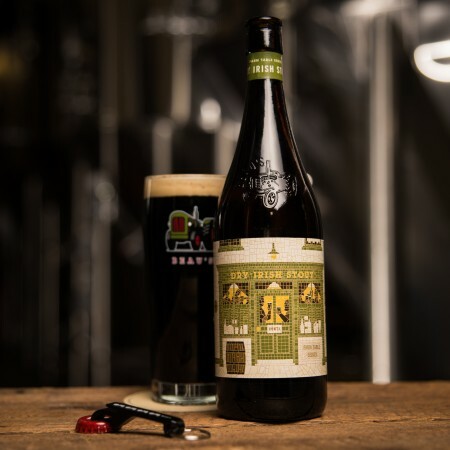 Dry Irish Stout will be available starting tomorrow (February 14th) in 600 ml bottles at the Beau’s retail store and taproom, and on tap at over 300 bars and pubs across Ontario, Quebec, and Manitoba. For more details on Dry Irish Stout and other beer releases and events planned for the month, see the FeBREWary page on the Beau’s website.